A customer can ask a Question directly on a Quote. You'll be prompted to answer the Question with an Email Notification and a Dashboard Message, which will remain until you answer or dismiss the Question. As a Quote Author, you can add a Private Note to a Quote, which only you and your fellow Team Members will be able to see. Learn more about using Private Notes. You can add files and images to any Comment, Answer or Private Note. 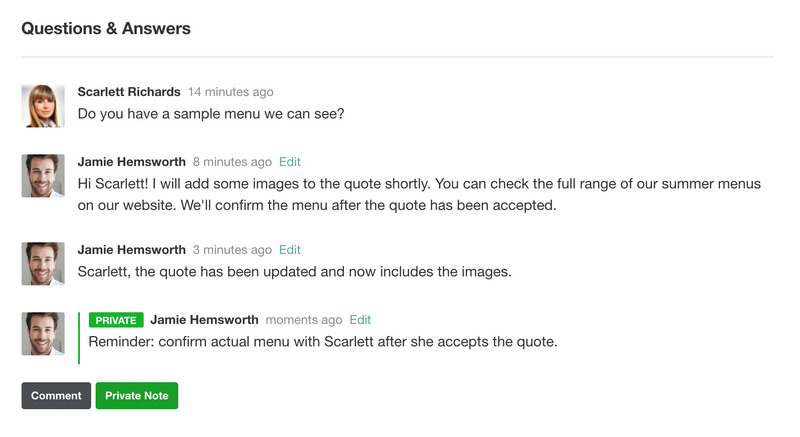 Quote recipients can also add files and images when asking a Question on a Quote. Simply drag and drop your file or image from your computer onto the Comment, Answer or Private Note, or hit the 'Add Image or File' button, then browse for your files or images.